As I’ve long noted I don’t tend to read current affairs but I have also noted that I make somewhat eclectic reading choices. 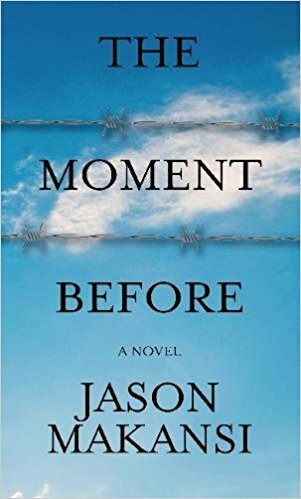 The Moment Before by Jason Makansi touches on some very current issues indeed. I thank TLC Book Tours for sending me a copy to review at no charge. A woman and her beloved Syrian father, separated forty years earlier when he is swept up in a geopolitical odyssey from hell, are almost reunited by a lawyer struggling to save his Illinois hometown from financial ruin. The unflinching story of an American-Arab’s life in limbo. Tricked by the two people closest to him, Elias Haddad leaves his beloved daughter Cheryl Halia for what he believes is a short trip home to Syria to visit his dying father. Largely ignorant of Middle East politics, Elias is detained upon arrival in Damascus and conscripted into Assad’s army, beginning a forty-year geopolitical odyssey from hell which culminates in his captivity in Guantanamo during America’s post-9/11 War on Terror. In her search for her father, Cheryl meets John Veranda, an idealistic lawyer who risks his family’s land, his marriage, and his aspirations for his hometown’s future for a relationship with Cheryl neither are prepared for. Stuart Eisenstat, a dedicated federal bureaucrat, thinks he’s doing an old friend a favor when he picks John’s hometown as the perfect site for relocating Guantanamo detainees only to come face to face with the personal cost of America’s global ambitions. Jason Makansi, author of four non-fiction books relating to business, energy/environmental issues, and mathematical modeling, has published short stories in a variety of literary journals and collections. He is a 2009 alumnus of the Sewanee Writers Conference, has reviewed short story collections for The Short Review, and is currently a contributing editor for River Styx literary journal and Associate Editor for December literary magazine. In his spare time, he plays the viola in community orchestras, plays piano for fun, and rides his bike as often as he can. The Moment Before is his first novel. I was drawn to this book by the synopsis; we are certainly living in uncertain times. It was a surprising read in many ways; I was expecting a far more political read and what I got was more of a family drama. In some ways that was good but when the politics did enter into the story it was a hard fit. Cheryl Haddad loves her father and they spend a lot of time together. He is a taxi driver and her mother is a police officer. Her parents marriage is not a happy one but she does not realize this until much later in her life. One day her father heads off to his homeland to visit his dying father and he just disappears. She never hears from him again and her mother does nothing to try and find him. This impacts her entire life. While this is Cheryl’s story there are other subplots going on at the same time involving an idealistic man trying to save his town. There is the story line that sort of tells what happens to her father. There is another that follows a DHS honcho working to bring a prison project to fruition to house detainees from Guantanamo. There is also Cheryl’s mother and a mysterious priest who may or may not be a priest. All of these stories go back and forth in time with no real sense of order. It took me quite a while to sort out the back and forth and forth and back. There is a very good book in this book somewhere, you just have to work a bit to find it. It’s not the kind of book you can stray from or skim through. You have to pay attention or you miss which year you’ve gone back to or which character’s life you are now inhabiting. I think my poor addled brain was just not up to keeping it all straight. I wanted the answers. I wanted to know the whys. I wanted to know how in the hell the horror at the center of this book could even be imagined. I think I need to read it again because I’m still confused. I don’t understand how Cheryl’s father could be THAT naive. I don’t understand how Cheryl’s mother could be THAT evil over issues that could be dealt with in better ways. I don’t understand how I could get to the end of this book and still be so unsatisfied. But I guess there is much to be said for a book that gets a person thinking to this degree. As I noted – there is a good book in here. I think it’s just over my head somewhere. I think I may be just too literal a reader. It’s certainly a provocative book with a laundry list of issues to get you thinking. Imma gonna read it again to see if I can get it to make more sense for my poor little brain. One lucky US reader will win a copy of The Moment Before. Just enter as many ways as you would like on the Gleam widget below. Full rules are on the widget. Good luck everyone.